Are humans just multicellular yeasts? Again via the Brent Kearney link on Stan's site. These results are just the newest chapter in a "decade-old interest," according to Gottschling. He and his colleagues have made several landmark discoveries in the past 10 years, including finding that aging yeast cells exhibit the same genomic instability seen in human cancer cells and proving that mitochondrial dysfunction causes that instability. Gottschling's team also has developed innovative tools to leverage the power of yeast as a model organism, including a technique called the Mother Enrichment Program that makes experiments more efficient by enabling researchers to generate large populations of aging yeast cells. "It's worth using yeast to study complex things like aging because a lot of person-years of research have gone into understanding the fundamentals. The genetic and cell-biology tools available for studying yeast are unparalleled," Gottschling said. "Having the proper tools is like having new glasses; you can see things you never could before, and once you start to see new things, you can dissect them to understand how they work." The full paper is a Letter to Nature. That means it is technically very dense, but very interesting. Caloric restriction to a yeast is, essentially, glucose restriction. In organisms with a circulation, an hormone system and a background FFA supply, caloric restriction at the cellular level (where it matters) is achieved by resisting the insulin mediated facilitation of glucose access, ie glucose restriction. Using superoxide. 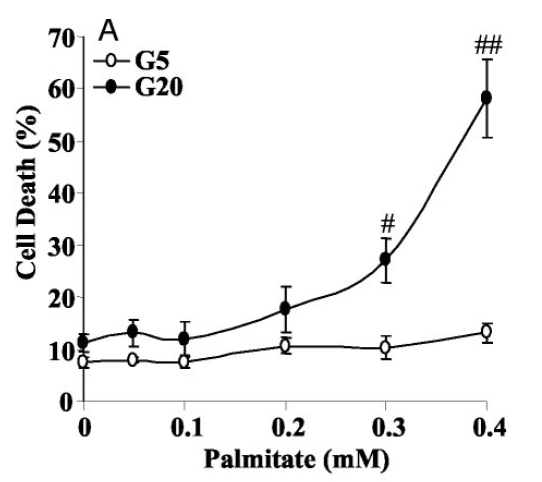 Palmitate please, with just a very little glucose. Labels: Are humans just multicellular yeasts? I picked this up through the link to Brent Kearney's blog on Stan's site. Olivine and water under a CO2 atmosphere, all present on Mars, are the precursor to biochemistry. I just wonder... Interesting times. 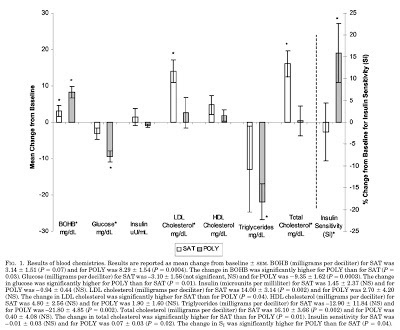 George put up the link to this paper, which allows you to tease information out about omega-3 PUFA as bulk calories vs lard as bulk calories. We are not talking about essential supplies of essential lipids here. We are looking at serious bulk calorie supply. This is quite, quite different. Aside: The basic conclusion that FO is protective against endotoxin shock is fascinating but may be restricted to C57BL/6 mice. Pity everyone uses them. But it's interesting, and on file, never the less. End aside. Fairly typical research diets, a little more sucrose than I would like but, well, everyone does it. Although body weights, at all time point, are not significantly different between groups this is just due to the initial group weights being different. 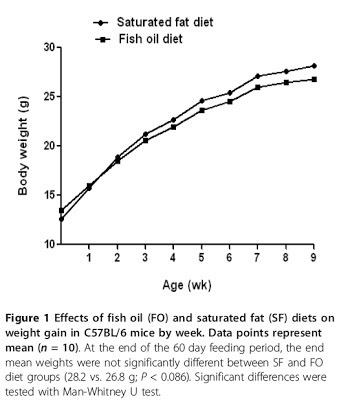 If you look at weight gain rather than absolute weights, the lard group gains more weight than the fish oil group. 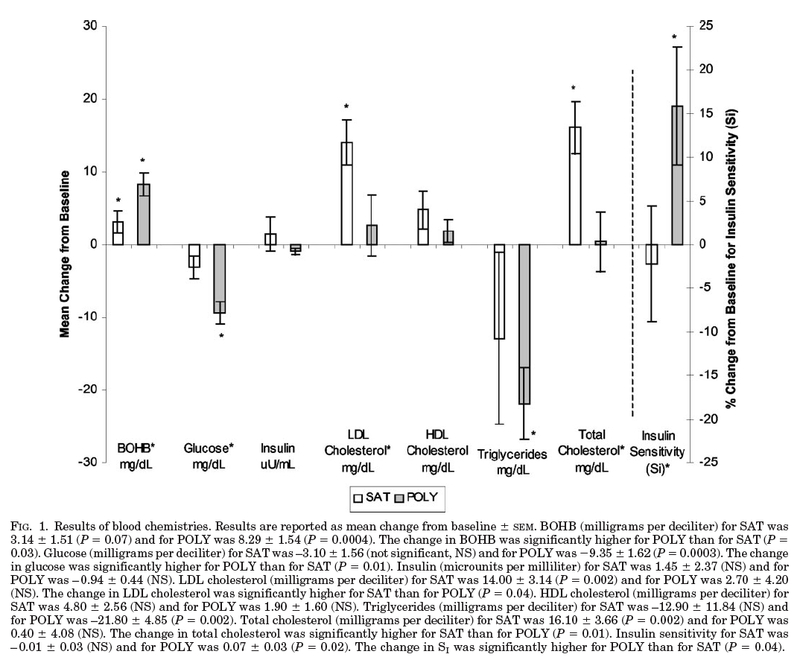 The insulin and glucose levels do support the idea that insulin sensitivity is controlled by the degree of unsaturation of the bulk lipid in the diet, ie PUFA diets increase insulin sensitivity. 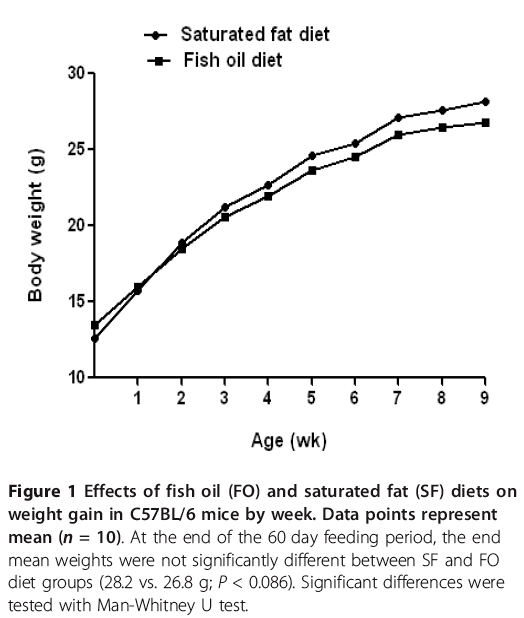 But there is no excess weight gain in the fish oil group. Why not? C57BL/6 mice suffer an injury to their hypothalamus on exposure to a saturated fat based diet, especially if combined with sucrose. Omega-6 PUFA do not seem do this and I doubt omega-3 PUFA do either. I considered this back here. So we are comparing obesity in an un-injured group carrying omega-3 enhanced insulin sensitive adipocytes versus a hypothalamic injured group carrying adipocytes which are partially resistant to insulin due to dietary palmitic acid and partially sensitive to insulin due to decreased sympathetic outflow from the hypothalamus to adipocytes. C57BL/6 mice are very special in their response to saturated fats. This is a knotty problem to try and untangle. This paper helps a lot. I just want to look at two of the control groups, both of which are C57BL/6 mice, both of which are exposed to a high palmtic acid diet and so both will have an hypothalamic injuy. First, strain your eyes to follow the open triangles. This is the high fat only control group. These are C57BL/6 freak mice with a brain injury triggered by palmitic acid. They have limited weight gain but, as they store palmitate without DNL, hence without desaturase activation, hence without palmitoleate generation, they develop metabolic syndrome. Visceral fat, fatty liver. 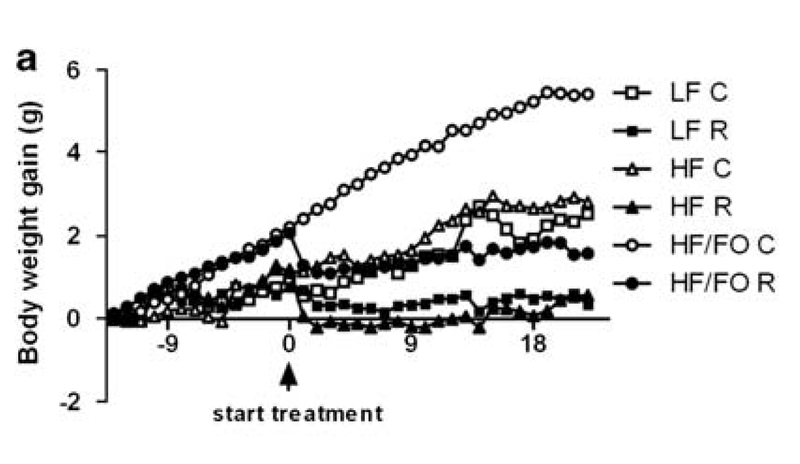 Of course the group didn't measure either insulin or glucose (they are in obesity drug development), but these mice have metabolic syndrome and have lost the ability to get any fatter. They are in trouble. 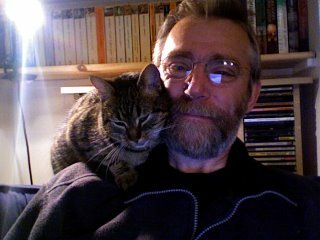 They don't actually weigh any more than un-injured C57BL/6 mice fed traditional crapinabag. Now look at the open circles of ever increasing obesity. Fatties or fatties? This is what happens when you add fish oil to the diet of a palmitic acid injured C57BL/6 freak mouse. Impressive waistlines huh? Of course we don't get the insulin or glucose levels here either, but these mice do not have metabolic syndrome. They maintain the insulin sensitivity of their adipocytes, especially peripherally, and continue to become obese with sustained metabolic health. They will stay healthy until their adipocyte distension induced insulin resistance eventually over rides the insulin sensitising effects of the bulk fish oil. We have a pair of models. Skinny-fat and obese-but-metabolically-slim. Both are explicable by looking at the basic effects of bulk lipid supply from the diet acting on the insulin signalling system within mitochondria. Summary: These are palmitic acid injured C57BL/6 freak mice which have the added insult of having their adipocytes rendered extra insulin sensitive by the F:N ratio of a significant percentage of the fatty acids in the fish oil of their experimental diet. This postpones metabolic syndrome until they have become fat enough to develop it. The F:N ratio concept delivers again. 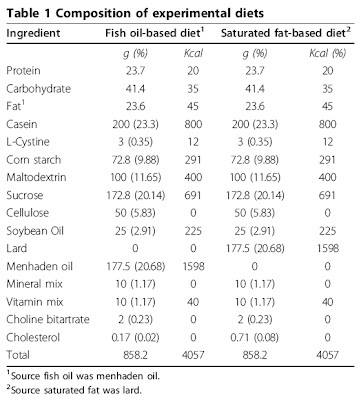 BTW no one knows the omega-6 content of the fish oil is in this second study! 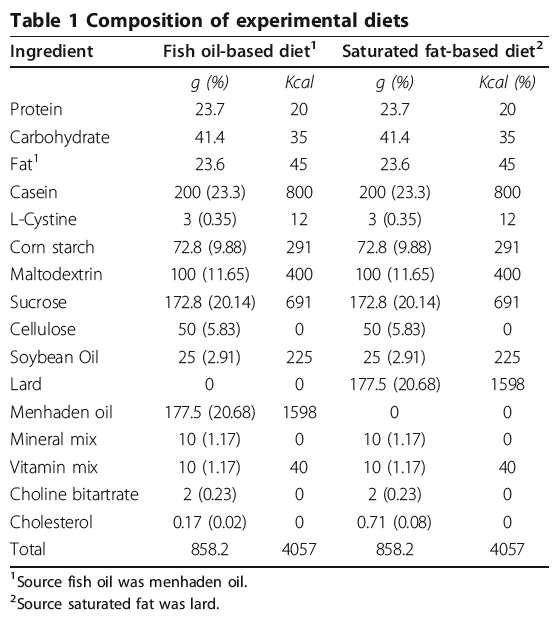 The discussion mentions that there is zero omega-6 in the basic high fat diet, which has no added fish oil. Imagine running a Rimonabant study when you don't know the omega-6 content of the (high fat) diets. But this becomes irrelevant if you look at the basic metabolism at the molecular level. 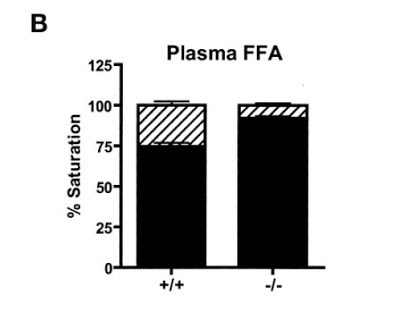 Either family of low F:N ratio PUFA will delay metabolic syndrome, while ever they assist weight gain. And you have to remember that C57BL/6 mice break by eating butter. Edward sent me this paper. I think I did already have a copy on my hard drive but you can't really start to make head nor tail of what is really going on until you have a handle on F:N ratio and the physiological role for superoxide. I'd completely forgotten about the paper. 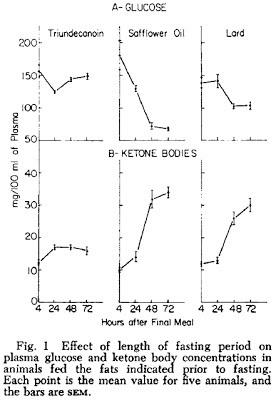 Look at the glucose, lowest in the PUFA group, look at the ketones, highest in the PUFA group, look at the insulin sensitivity, waaaay higher in the PUFA group. Rat or human, makes no odds. 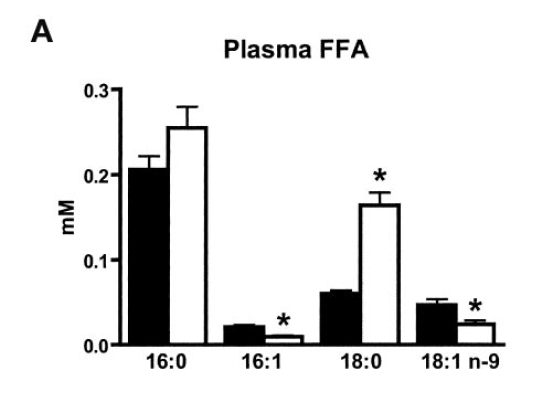 PUFA fail to generate superoxide in mitochondria. Is this good or bad? 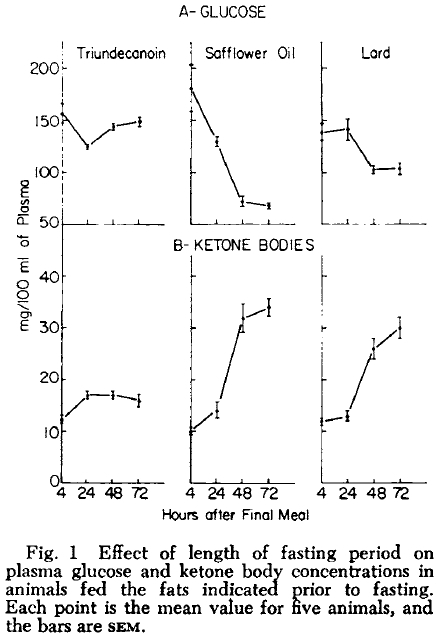 The whole point of a ketogenic diet (epilepsy excepted) is to induce starvation-appropriate physiological insulin resistance. What is the point of setting up a ketogenic diet which does not have the ability to convert from running on glucose to running on fat? Aside: Why might anyone want to run their metabolism on FFAs? Superoxide. I want more mitochondria to supply spare ETC capacity, to minimise the sort of levels of free radicals which wipe out mitochondria when the pressure is on. Physiological superoxide signals for mitochondrial biogenesis, without all of that tedious exercise to do the same job on a mixed diet. End aside. Now it is just possible to argue that chronically reduced insulin may render adipocytes immune to the insulin sensitising effects of PUFA. Maybe. The obese mice of the next Protons post are on a mixed PUFA-carb diet to assist their "ballooning" experience. High insulin plus insulin hypersensitive adipocytes gives obesity. Perhaps the combination of low insulin with distendable adipocytes is OK if the insulin levels are low enough. Volunteers queue over there please. But we are still in a situation where FFAs are high, yet glucose can still enter cells. What does this do to cellular ATP status? The whole point of insulin resistance is to avoid cellular caloric overload, full stop. If you load liver cells with PUFA and add in glucose the end result, by whatever mechanism, is cirrhosis. Perhaps other tissues fare better. Am I about to try it? And for a real giggle you can see exactly what sort of utter crap made up the high PUFA diet, just read Table 1. "Imitation" if the first word of the first "food"! Woody emailed me a pdf of this venerable paper. I like it. Even though it was generated in-house by Proctor and Gamble! Mmmmmmmm, linoleic acid, the elixir of life and Weight Watchers' friend. And I thought it was obesogenic! So what does the small print say? Lots! First thing to make my ears prick up is that during the whole study the rats were only allowed to eat for 2 hours a day, in a single solid block. That means they were force fasted for 22 hours a day. We've noted from Table 3 that safflower oil allows greater weight loss under fasting conditions. 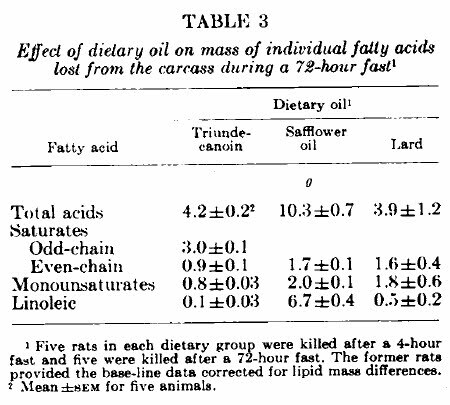 So is it any surprise that the safflower rats ended up at 195g vs the 222g of the lard fed rats after eight weeks of this intermittent fasting? I'll come back to why in a moment. But that's because there is a difference between ad lib feeding and 22h per day forced fasting! Now, far be it for me to put words in to the mouth of a lab rat, but which group of rats is the hungriest? Which group becomes most hypoglycaemic perhaps? Even Dr You-are-confused-man-Guyenet seems to have, in an aberrant moment of lucidity, a glimmering of perception that hypoglycaemia makes you hungry. Or should I say drives eating behaviour? Did I ever even mention gluttony? If you are force fasted for 22h you can't overeat. You can't even eat to your metabolic needs without accessing significant amounts of stored fat. Under full starvation a rat lives off of its fat. If linoleic acid is what is being released from the adipocytes under fasting conditions it provides significantly less FADH2 relative to NADH in to the electron transport chain of all fat burning cells than the mix of fatty acids from the adipocytes of lard fed rats. ie there is less physiological insulin resistance. This failure means you fail to keep glucose levels normal during starvation. Let's rub that in: Failure to develop physiological insulin resistance during starvation results in hypoglycaemia and hunger. Exactly the same will happen in any soy oil fed USA citizen. The end result will still be the failure to develop the essential physiological insulin resistance which is needed to keep blood glucose normal during fasting. When the average soy oil fattened American is asleep they HAVE to, finally, stop snacking on carbohydrate crap, which is the only way they can maintain a decent blood glucose level. At this time blood glucose falls, simply because their muscles stay insulin sensitive and glucose falls in to them. The brain will not accept hypoglycaemia. Some time, in the middle of the night, there has to be a Refrigerator Raid. And, OMG, they eat calories! And calories count! Did I ever mention gluttony? Or, perhaps, is the Refrigerator Raid simple physiology? The 22h daily fasted rats have a locked refrigerator. However hungry they feel due to hypoglycaemia, they are not getting any extra food. But why is there extra weight loss under starvation? 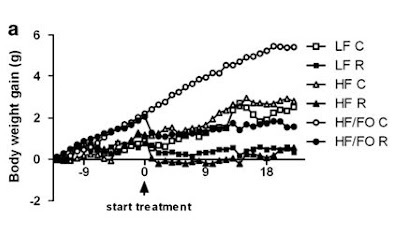 Insulin was tricky to measure from a rat in the 1970s, but I know that the safflower loaded then starved rats had the lowest insulin as they are both insulin sensitive and hypoglycaemic. Low insulin = more lipolysis = more ketones and more weight loss. Logical. Now let's go a step further. Blood glucose is low. It's low because the F:N ratio of linoleic acid is low and that's what is being released from adipocytes. This is metabolism. Individual cell by individual cell, it's a metabolic phenomenon. Picked up by the brain as hypoglycaemia. Hypoglycaemia must drive food intake to avoid cerebral catastrophe. Glucose is not a neurotransmitter per se. The hypoglycaemia has to be converted to a neurotransmitter based message to affect behaviour. Oddly enough, a derivative of linoleic acid is a neurotransmitter. Linoleic acid is the parent molecule of the endocannabinoids. Even the cleanest nosed obesity researcher has heard of the munchies. Wouldn't it be funny if eating linoleic acid messed with your blood glucose level and this hypoglycaemia triggered the production of endocanabinoids from, you guessed, the parent molecule (of the hypoglycaemia! ), linoleic acid within the brain? The same molecule which triggers the hypoglycaemia, making the hunger essential, in the first place. You could view it as linoleic acid ingestion is a signal that hypoglycaemia is in the offing. If random evolution was looking for a substance to "choose" as a neurotransmitter to deal with hypoglycaemia, it might just be simplest to modify the basic lipid which is most prone to trigger low blood glucose throughout the body in the first place... You could then end up thinking that the endocannabinoids "just happen" to control appetite as a primary function. Of course, once the control system is in place you are all set to mess with it by demonising saturated fat and pushing corn and soy oils. Well, I find the concept hysterical. But then I find most brain centred obesity research pretty amusing. Our daughter has taken to watching DVDs. When we are not being tortured by Postman Pat (Special Delivery Serrrrrrviccccce, you know the tune) or the Mickey Mouse Clubhousssse we do at least get some amusement when she requests that blistering LC comedy "A Matter of Loaf and Death", by Nick Park. Just how funny you can make a story about an obese cereal killer (no typo, the subtitles specify cereal killer, I said Park is funny! ), murdering bakers as revenge for her obesity ("Are you ballooning?") has to be seen to be appreciated. 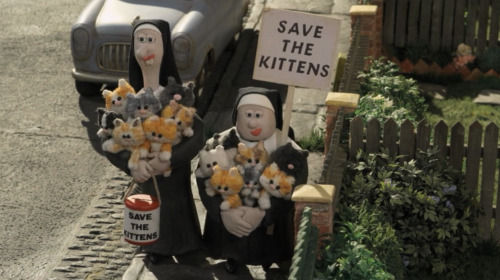 It's a lot more amusing than Postman Pat. 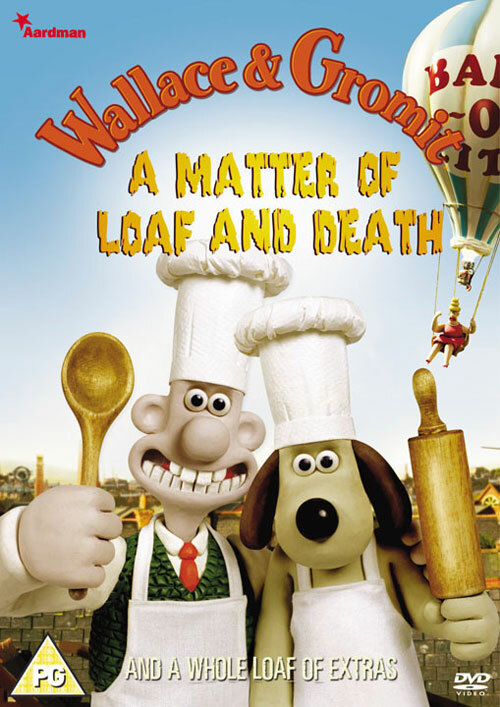 One of the funniest scenes is where Gromit cannot get rid of Paella's bomb. It's a direct tribute to the 1960s Batman scene where "Some days you just can't get rid of a bomb". and included Yorkshire as the preferred site for bomb disposal. The Wars of the Roses are, apparently, over but not forgotten. This post is about how physiology uses SCD1 to dispose of the metabolic bomb of hyperglycaemia in the presence elevated levels of palmitic acid. I love this group because not only do they tell you in the methods section EXACTLY what glucose concentration they used in culture (5mmol/l vs 11-25mmol/l) without making you go back through three layers of references (to bury the 25mmol/l most groups use, but never discuss), but they also describe 11mmol/l as hyperglycaemia. That is, pathology. It's also worth noting that stearic acid had to be reduced from the original 0.4mmol/l to 0.25mmol/l because at the higher concentration with high glucose they found exactly the same thing as Dave Lister did in Red Dwarf when Holly brought him out of stasis. Everyone is dead Dave. Everyone. Is. Dead. Dave. You have to U-tube the clip. 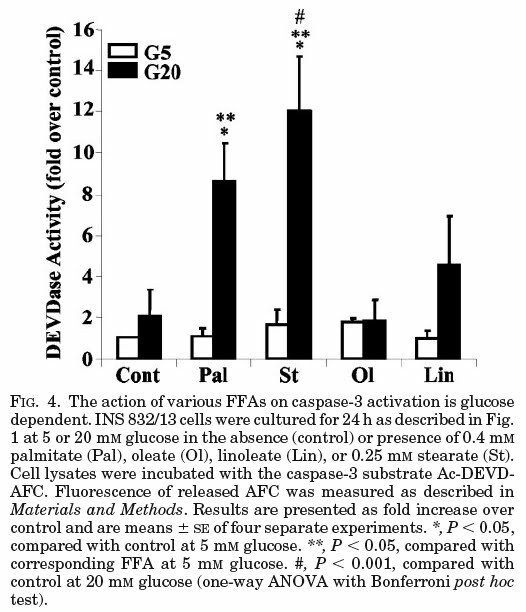 Stearic acid at 0.4mmol/l with glucose at 25mmol/l, in cell culture, is utterly lethal to beta cells. If you pharmacologically block apoptosis the cells simply undergo the rather messy collapse of necrosis. This is a non survival insult. The group went on to do quite intersting things with blockade of acyl-CoA synthetase and also with inhibition of fatty acid oxidation, which leads to all sorts of other threads which are, in part, where I have been wandering for the last few weeks. Far too much for this post. A ruler and calculator gives FFAs for the normal ob/ob mice as 0.32mmol/l and for the SCD1 k/o ob/ob mice as 0.56mmol/l. Any group which makes you reverse engineer in this way to get something as simple as FFA levels is, in my book, highly suspect. Does anyone think that 0.32mmol/l is quite low? Despite the greater obesity. Partly due to maintained insulin sensitivity in adipocytes (that's why they distend) while ever de novo lipogenesis produces palmitoleate using SCD1 and partly due to the higher levels of insulin production (normal beta cell mass) working on those insulin sensitive adipocytes... These mice are still in a slightly privileged position, metabolically, as they have yet to become obese enough for their SD1 equipped adipocytes to become seriously insulin resistant, they are still only six weeks old. And here is the % of types of FFAs. The column on the left is the one which represents about 0.32mmol/l of total FFAs and the column on the right is around 0.56mmol/l, as above. Glucose varies but fasting levels can be as high a 700mg/dl. So what happens to beta cells? They divide up in to two types. The health ones and the dying ones. The basic finding is that young ob/ob mice need either oleic or palmitoleic acid to maintain a functional beta cell mass. Exposure to high levels of glucose combined with palmitic and/or stearic acids induces apoptosis plus some necrosis in beta cells. Most non pancreatic tissues in the SCD1 knock out mice appear to be able to upregulate beta oxidation, especially in peroxisomes, of fatty acids which minimises both obesity and insulin resistance. The beta cells of the pancreas do not appear to have this luxury. They need to lower that F:N ratio with palmitoleate or oleate, otherwise they are left holding the bomb. Still no time to post but this one liner is another gem. Dalcetrapib, another (yawn) HDL raising drug has bombed. Who is surprised? Funnily enough Dr Nissen (Rentaquote-you-have-a-statin-deficiency) feels dacletrapib failed because it was too weedy to do any good, only a 30% increase in HDL. Evacetrapib (Nissen's gravy train) and anacetrapib will REALLY work because they double HDL and slash LDL. No they won't. They will do exactly what torcetrapib did as they are as potent as torcetrapib was. Body count will rise. Dalceptrapib killed no one as it is not potent enough to do so!